Jerome Calvalido graduated from the Ecole Nationale Veterinaire of Toulouse, France in 2011, and completed a small animal rotating internship at the University of Montreal, Canada in 2012. He worked for one year in the oncology service at the DMV center in Montreal as an oncology intern. He completed his oncology residency at the University Of Guelph, Canada 2013 to 2016. The residency was combined with a Doctor of Veterinary Science (DVSc) research program during which Dr. Calvalido studied the evolution of circulating cytokines in dogs with lymphoma treated with chemotherapy, and their impact on prognosis. He became a diplomate of the American College of Veterinary Internal Medicine – Oncology specialty in 2016. 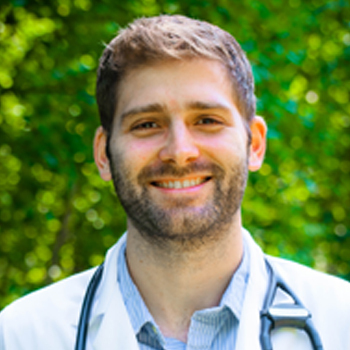 Dr. Calvalido worked as a clinician at the University of Guelph and the DMV center, before joining the Tufts VETS team to develop the oncology service. Dr. Calvalido and his girlfriend live with two sibling cats named Charles and Louis. Dr. Calvalido will be seeing patients starting the end of March.